Q8 Utilize 4 x CREE XPL V6-3D Led, projecting up to 5000 lumens. The Quad aluminum reflectors ensure the light reaches a throw range up to 492 yards. Highly Customizable: Q8 uses the latest NarsilM, which supporting multi channel output configurations. Users could set the interface as easy or complicated as you like. 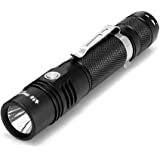 A must have for flashlight enthusiast. Long Runtime: Runs off 4*18650 button top batteries lasting up to 1500 hours(Battery Not Included). Integrated power indicator in side switch indicates remaining battery power.The light is intended to be used with button top 18650 batteries. We highly recommend the use of protected cells. Compact and Durable: The plam sized light was constructed from aerospace grade aluminum alloy with premium Type III hard -anodized. All circuitry contact points are gold plated, enabling better conductivity and more durability. Strenthened thermal heat fins make the light stable in real working conditions. Tripod mount:Integrated camera type thread mounting point make it convenient for users to use the Q8 light on standard tripods as an exterior light or for fixed illumination. 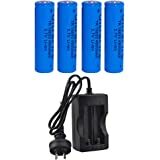 Batteries: 4 Lithium ion batteries required. I've had the Q8 for a few weeks now, and as a torch collector and BLF regular I like to think that I know my way around a flashlight. 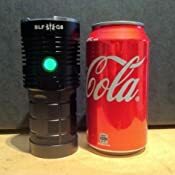 The Q8 began life on BudgetLightForum as an idea to create the best bang for buck "soda can" light available and over the course of a year a team of BLF members developed it from the ground up using a set of criteria that Thorfire needed to meet before the light got the BLF stamp of approval. To say this light is brilliant is bordering on an understatement. The finalised torch not only met but exceeded the criteria and Thorfire even added an led illuminated switch as a bonus. -The ramping user interface is fairly easy to use, but with that being said this is a "professional" torch with advanced mode options. 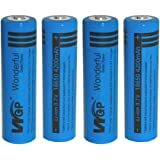 -It is bright and really is around the 5000lm mark but one has to use high quality, high drain 18650 batteries to achieve this. -The hotspot tint is excellent at higher levels and the spill tint shift is good for this style of led/lens combo. -The flood/throw ratio is just about perfect, and making a diffuser cover (BLF has suggestions) for the lens turns it into a great lantern. -There is no glue on this light so modders can easily open it for spring bypassing and led swaps. -The illuminated side switch is a little bright for my liking, however in the case of a blackout it would be easy to find before ones eyes have adjusted to the dark. It has a standby time of years and can easily be user disabled. The Q8 is a must have for any serious torch collector or those needing to light up a large area. This light has gone straight to the top of my favorite lights. The ramping UI is absolutely perfection, you can choose literally any brightness between <1 lumen to 5000 lumen. The green lit electronic switch is easy to find in the dark, the neutral white 5000k tint is sooooooooo good, shows colors really well at night instead of washing them out like cool white 6500k tints do. 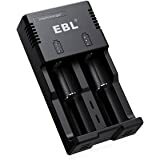 It can also run on anywhere between 1 and 4 batteries, however more batteries means longer runtimes, so running 4 is recommended, also better for sharing the load between the batteries. This light can run on max 5000 lumens for a surprisingly long time too, has excellent heat management. Anyone that needs a can sized flood light with perfect tint should look no further. Best batteries for this light are Samsung 30Q button top, flat tops don't work. Probably considered an enthusiasts torch. Super bright. Works very well. Very fiddly user interface. It would be better if it could be plugged in to a computer and the software reprogrammed that way. Most torches with different settings have steps, which is what I am used to. This one, out of the box, has an infinitely varying brightness, which goes up and then down. So gets a bit trying. This torch can be set up to have step-modes but the provided instructions are very confusing. Even the 3rd-party cheat sheet I found online, which does a much better job than the supplied manual, is still not straightforward to understand. There are multiple different step-modes that can be set - e.g. five steps, two steps, six steps, etc. Find the one you want in the specifications. Then put the torch into programming mode (complicated series of button presses). Then program the torch (more complicated button presses). After all that, it is super bright, lasts really well, durable, useful. Just don't point it at anyone close by or you will blind them temporarily (ok may be useful against a mugger). I bought one of these about 2 month ago and haven't really used it to its full extent until recently. Last week I took this torch to a fishing/prawning trip and am extremely impressed with the performance of this light. As my prawning trip was done at night in a very isolated lake, after using the Q8, any other smaller torches used after this just seemed very weak. The Q8 allowed me to light up a very large area due to its "floodiness" which was beneficial for me as otherwise I would not have seen where I was walking. The build quality of the Q8 is very impressive, having dropped this torch into water accidentally multiple times, the torch is still working perfectly fine. The only downside to this torch is the weight, but this is due to the 4x 18650s used to power the torch. 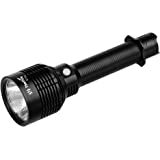 If you consider the lumens output to its weight, it is actually very light and portable. 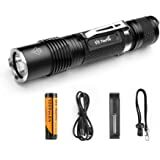 If you are coming from a small handheld single battery torch, you may find yourself taking some time to get use to. 5.0 out of 5 starsWorks as expected, quality is great. Not much to say, and I agree with the various reviews on Youtube and elsewhere that the flashlight is great. Getting the unit at a discounted price is a no brainer, and normal retail is fine if you can't wait due to need. Just make sure to budget for good batteries and a charger if you don't have one. It is easy to operate, and comes with various spare O-rings. Gets quite warm at higher levels, but is expected. Bouncing low levels off a white ceiling is very effective for quite large rooms, so will be great in a blackout. I am running out of words so my review is at an end. 5.0 out of 5 starsA brilliant torch. There's no other way to say it. Fantastic value for money. On turbo mode, this torch is like having daylight in your hand. Pointed at a white wall about a metre away, the centre of the beam is difficult to look at, it's that bright. The battery life on non-turbo mode is excellent. I reckon I get around 5 hours. You'll probably have to worry more about the heat generated than the battery life, especially with turbo mode. 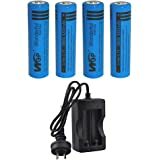 Would highly recommend for the price, though buyers should consider the cost of 18650 batteries - a decent set of batteries with an OK charger will set you back approximately $70. 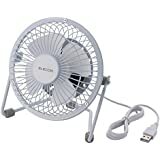 5.0 out of 5 starsSeller and product excellent. Amazon reviews annoying. This purchase was a pleasant experience until I wrote the review. After much effort in making lots of helpful comments, I was told my review was too long. So I deleted it. 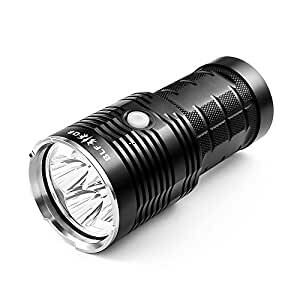 Bought this for my wife as she needed a decent, bright torch for school camp (being a high school teacher) and the BLF Q8 suited this need perfectly. 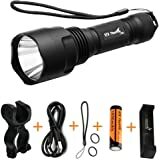 I only wanted to spend a couple of bucks, but actually get her a reliable, bright and solid torch and the Q8 delivered. She loves using it and it hasn't let her down yet. Great torch for beginners.